The purpose of the Trainer’s EDGE course is to help develop the platform skills of a trainer. 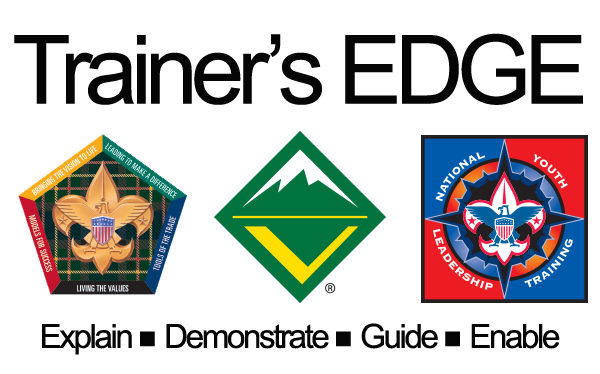 This course supplements NYLT and Woodbadge, and it is a required course for anyone staffing either of these advanced courses. Trainers should take this course every two years to improve skills. This is a hands-on class, where participants learn how to effectively speak in front of a group and delivery training. Participants will be sent instructions with the pre-assignment. Fee: No fee! Bring your sack dinner if you like. Dessert provided. If you have any questions - please email me. Course minimum - 3 students to avoid cancellation.